As 'peace talks' go on, official Facebook page of PA Chairman's Fatah party once again features calls for violence against Israel. The threats came in the form of a video by Fatah's armed wing - the Al Aqsa Martyrs Brigade - which threatened to turn Tel Aviv "into a ball of fire", as well as escalated rocket fire on Israeli civilians. Al Aqsa Martyrs Brigade has been declared a terrorist group by the US, EU, Israel and Canada, among others. 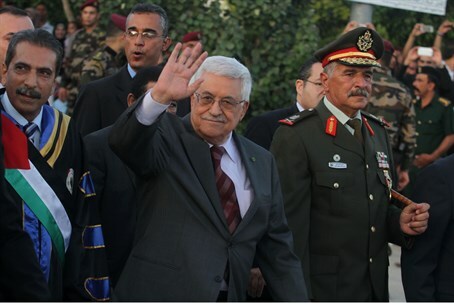 The threats come despite the fact that the Palestinian Authority is engaged in "peace negotiations" with Israel, and bolster claims by Israeli leaders that the PA is not really serious about finding a peaceful political solution to the conflict. The findings also show that during the period of negotiations between Israel and the Palestinians, not only did incitement not lessen, in certain areas it even increased, and that recently, the use of prominent Nazi elements - such as the image of Hitler - has also increased. Israeli officials - including Prime Minister Binyamin Netanyahu - regularly complain that the issue of officially-sanctioned incitement by the PA goes largely ignored by the very same diplomats who regularly berate the Israeli government for construction in Judea and Samaria. The Israeli Foreign Ministry recently summoned European diplomats to explain their countries' one-sided criticism of Israel, after several European countries summoned Israeli ambassadors over construction plans in Judea and Samaria. Prime Minister Netanyahu himself called out the EU for its "hypocrisy". "The EU calls our ambassadors in because of the construction of a few houses? When did the EU call in the Palestinian ambassadors about incitement that calls for Israel's destruction?" Netanyahu asked foreign correspondents at his annual new year reception. In at least one case, a terrorist who went on to murder an off-duty Israeli soldier used official PA TV to send a coded message of his plan to his jailed brother. But the involvement by the PA in diplomatic talks and the simultaneous calls for continued violence by its official organs may not be as contradictory as it seems. Another video exposed earlier this month by PMW revealed - not for the first time - how PA officials view negotiations, and subsequent Israeli concessions, merely as a "first stage" in the ultimate destruction of Israel, after which terrorism can be resumed "more effectively".